The location of this one day race on the 13th January was just outside of Ibstock in Leicestershire. The Forestry Commission now manages this 60-hectare, former open-cast coal site as part of The National Forest. The main thing I noticed on arrival was that all the tracks were compacted gravel and I have to say I breathed a sigh of relief, as with all the rain we have had, I was dreading a race on yet more mud. The morning was very cold and so there was ice around but the tracks looked in very good condition and on asking about the course, I was told there was only one steep downhill, albeit quite a tricky one with a series of sharply curved turns or ‘switchbacks’ to negotiate. The start chute sent you off away from the car park to begin but then doubled back so you were running up the road that had brought you down to the car park and then off up another track left towards the top of the park. 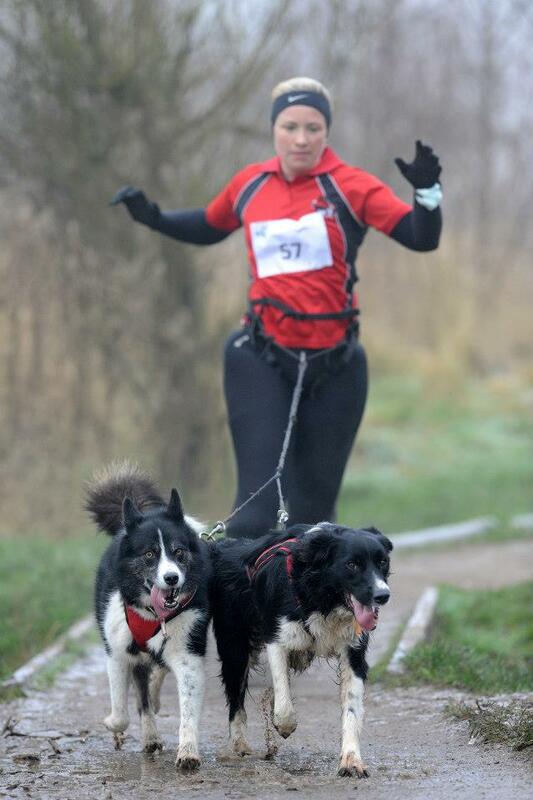 An uphill at the start is by far the easiest way to begin a race with two dogs, as they can burn off some of their energy on the uphill and settle nicely into the run for the rest of the route. At the top of the hill there were wide grassy tracks, which were a little muddy but nothing like the scale of mud we have seen at home and at previous races in the season so far. Then came the switchbacks which I was dreading, but the tracks were grippy in spite of the icy conditions and I came down the turns with ease, very smug with myself! The dogs were great too, they seem to be responding better to my voice commands at the moment and this combined with a new Zero DC waist belt (can be found at http://www.k9trailtime.com) which allows the line to slide around corners and not drag me around behind the dogs like some sort of a cannon ball on a line, has meant I am gaining more downhill confidence again. Onwards we raced towards the Horseshoe Lake in the middle of the park and then I did the one thing I thought I had surely avoided – fell over! I just caught the edge of an icy puddle on a corner and down I went like a ton of bricks. I managed to pick myself up quickly and limped along a bit before my leg stopped being dead and I could run on again. The rest of the course was thankfully flat and very easy under foot with the well maintained tracks allowing me to pick up a bit of speed, which has eluded me recently in training and racing. The finish, back up towards the car park was a welcome sight and I clocked the route on my GPS watch as just under 3 miles. 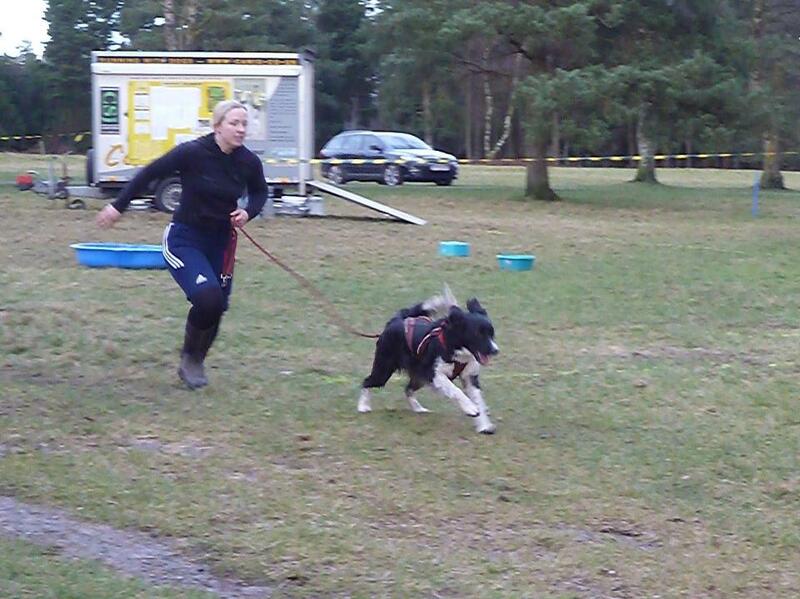 We finished near the bottom of the two dog class again and although disappointing for me to not be running my best, I can’t fault my dogs as they seem to be getting stronger and stronger. Just to prove it’s me who holds them back, a friend won the female class running with Judo, as I ran my other two and offered him as a running partner – at least he got the glory he deserved! To sum up the Sence Valley course, another great location with a few tricky turns but one I would consider to be an easier option for anyone beginning canicross racing. As I was jogging along at 5.30am recently with my dogs in the pouring rain, I found myself questioning what I actually achieve on a training run. What do I gain from them? What could I do to improve them, to get ‘more’ out of my early morning jaunts through the countryside? I couldn’t answer my own questions at first. I felt my main reason for the canicross training runs I have done in the past few months, was that I somehow think I should be training, not because I left the house with a particular aim for my run. Many people I race with set themselves goals for their runs, targets to beat in terms of times and distances so that they can improve their canicrossing and therefore get better results in races. 18 months ago I was doing the same thing, running with my garmin on for every run and checking every minute or so to ensure I kept my average speed above a certain point. Increasing my distance or decreasing the time it took me to run a certain distance, in order to progress with our racing. When I think about it, I realise I have been training just for ‘fun’. I haven’t had my garmin on because I don’t care how fast I run, I also don’t feel the need to know how many miles I have covered. 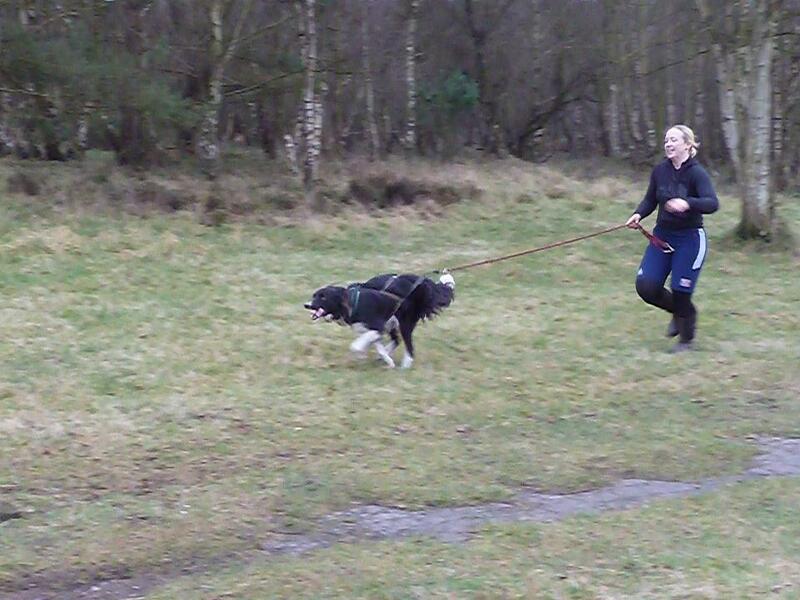 I have been running the routes I feel like running because the dogs and I enjoy them, not because they have steep hills for a challenge or long straight stretches for sprint work. Currently my training runs are about enjoying the limited time I have alone with the dogs out in the countryside and usually the peace and quiet that accompanies this. I watch my dogs and how they run, I make mental notes about who likes to run on which side and who responds quickest to a directional voice command. I realise I’m learning more about how I interact with the dogs when canicrossing and how they interact with each other when I run like this. When I first asked the question of myself and what I got from my training runs, I couldn’t answer with anything that felt satisfactory but after considering the little lessons I am learning, I realise that this stuff is just as important as the times and the distances we achieve. I am observing what works best for my dogs in a stress free environment and discovering things that will help us when I do finally decide to get back to the ‘real’ training aspect of canicrossing. Until then I’m happy to continue with my aimless training runs, safe in the knowledge I am still learning and building the foundations for a better ‘team’ effort in the future. 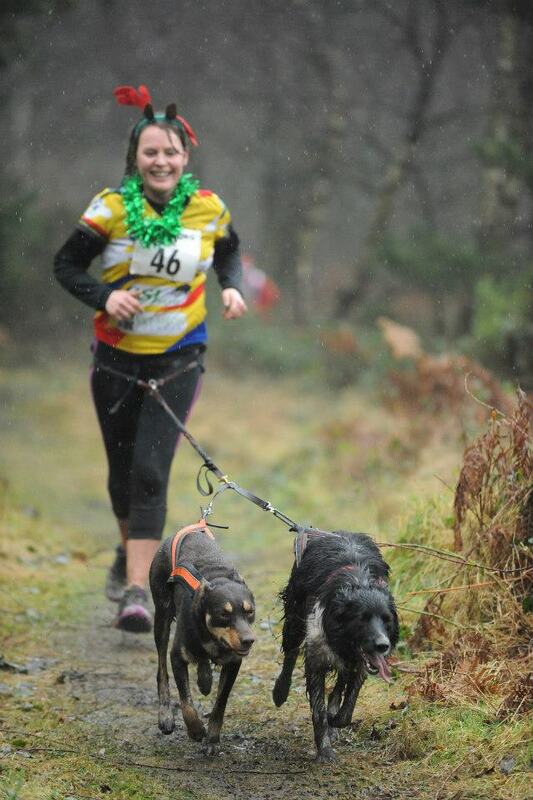 The Cannock Chase CaniX races were held the weekend before Christmas over the 22nd – 24th December at Cannock Chase, which is the smallest area of outstanding natural beauty in the UK. The weather was predicted to be wet and miserable for most of the weekend and it didn’t fail to deliver! The course itself was being run in reverse of the usual route, which meant the start chute was a fairly short straight into a sharp left hand turn. Another short straight then a sharp right hand turn took you out into the open and alongside a couple of fields before dropping down with a very sharp right hand turn into the wooded area of the course. The downhill section here was muddy and relatively steep, so on the bike or scooter (as we were on) you had to be careful you didn’t lose the back end sliding around as you made your way down. The middle section of the 5km was up and down some sizeable hills, in and out of the woodland and across the top of a moorland area of the chase. I had a two dog team on the scooter and it was a tough climb up a couple of the hills, with me spending a lot of time off the scooter and running alongside it to take the strain off the dogs. After the last long sloping climb you turned left into the wood and twisted through some muddy tracks to bring you back out onto the home straight, which was about half a kilometre and all slightly uphill. Coming into the finish area we couldn’t muster up enough energy on any day to come tearing over the line but I saw a few people manage it on foot. 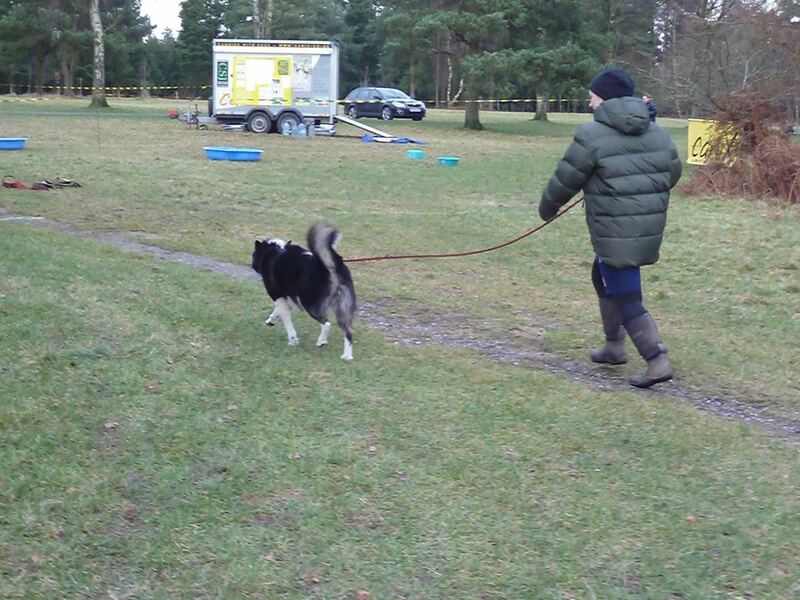 We managed Saturdays’ run with no mishaps but on Sunday a break in the weather meant an abundance of local dog walkers, most of whom seemed oblivious to the danger of letting their off lead dogs come charging in to say hello to my on lead dogs who were clearly working! I ended up having to slam the scooter brakes on so hard when one woman let her dog run into mine, that the back of the scooter flipped up and into me – sending me flying face first into the floor. Needless to say I wasn’t thrilled about this but picked myself up and finished limping over the line. 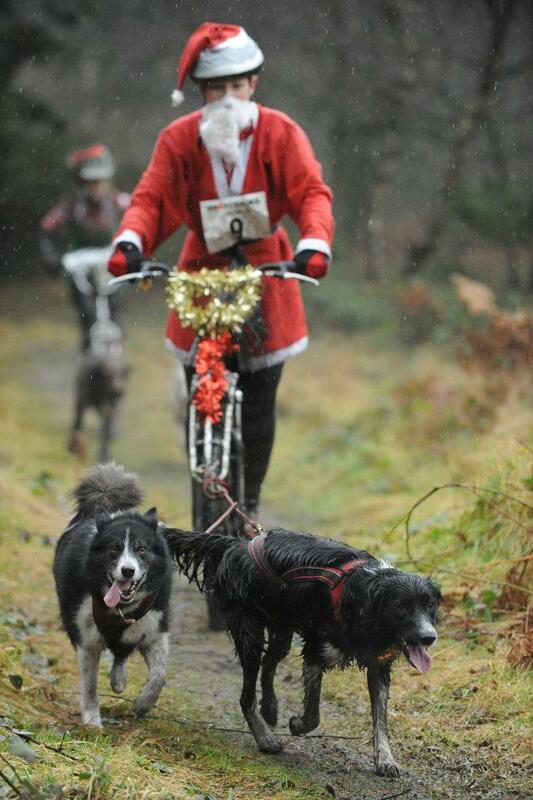 Mondays’ race was much more exciting as we all got dressed up with a Christmas theme to earn an extra few championship points and completed a ‘dogstacle’ course in the finish chute to show that we still had enough control and energy to complete a challenge at the end of 3 days racing. It made for great entertainment to see fairies, christmas trees and lots and lots of santas crossing the line, drenched from the continuous downpour of rain. 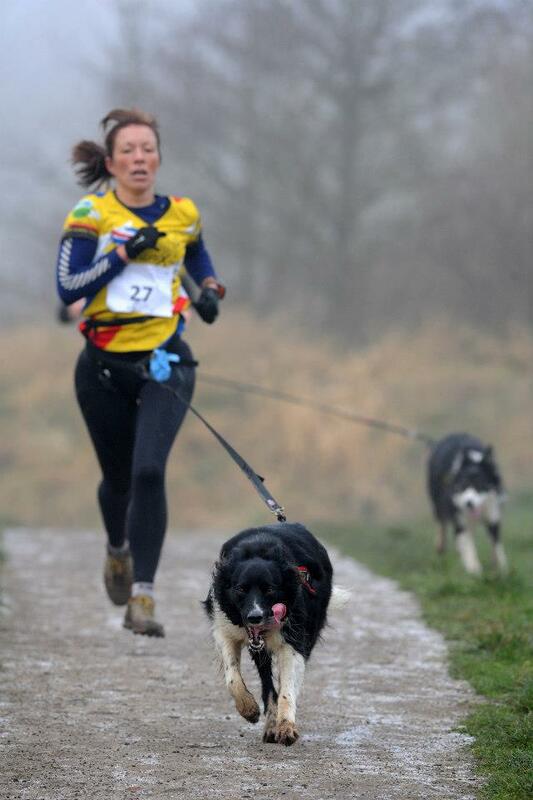 I think one thing that canicross racing has taught me is that no matter what the weather, with the right company and attitude, any run can be fun and we certainly thoroughly enjoyed our 3 days at Cannock.